I was on the verge of entering my “late” middle age in lousy shape with back pain and limitation of mobility effecting my quality of life. Like an aging car, my warranty had clearly run out. It dawned on me that I needed to do something and recruited my wife, Elaine to keep me accountable. We were committed to getting in shape, adding some muscle mass to see us into our “golden” years and improve our balance and flexibility. Our progress under Janis’ training has been remarkable. Now, I am in better shape than anytime since my thirties. My back problem is gone. We are both free of any physical limitations, and lead an active and healthier lifestyle. Getting into better shape has been a great success, and we can’t imagine our lives without exercise. 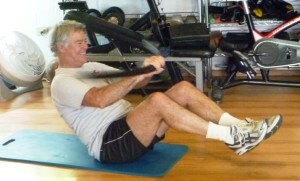 John shaking the Body Blade, training his core!